Facet joint treatment can be surgical or nonsurgical in nature and comes in a wide range of options. However, noninvasive treatment is generally only effective as symptomatic care and will not provide any hope for a cure. Remember that facet syndrome describes pathological structural changes in the spinal zygapophyseal joints. These changes will not resolve through the use of any form of drug, exercise or manipulation therapy. Although conservative treatment for facet joint syndrome is limited in its results, some practices can still be highly effectual for providing symptomatic relief. Better still, nonsurgical treatment allows patients to bypass the significant risks of spinal operations. There are obviously good and bad points to consider when thinking about undergoing conservative facet joint therapy. This resource section is devoted to noninvasive and minimally invasive facet joint syndrome treatments. We will examine the rewards of conservative and moderate forms of apophyseal joint treatment, as well as provide a balanced view of the limits and negative characteristics of symptom-based care. If you have been diagnosed with facet syndrome and are not sure how to find relief, then this is the article you need to read. Let’s begin by stating a basic fact of facet joint degeneration: It is normal and usually does not require any treatment whatsoever. Only pathological types of apophyseal joint deterioration are called facet syndrome and these are the varieties that might benefit from treatment. It is vital to remember that like many other potential scapegoat structural issues in the spine, facet joint arthritis often takes the blame for creating pain when it is actually incidental and innocent of any actual pathology. When treatment is indicated, the patient will have to decide between nonsurgical or surgical approaches to care. This is the main decision that needs to be made in order to match the best therapy to the patient’s individual needs, as well as their diagnosed condition. Completely nonsurgical therapies have far less risks to consider than moderately invasive needle-based practices that are also explored below. Symptom-based care practices, such as those detailed in this resource section, must be continued long-term in order to maintain any degree of efficacy. This can be financially expensive and will never lead to a cure. However, these conservative approaches to treatment are generally safe and certainly have fewer dangers than surgical endeavors. Of course the trade-off is the need for ongoing care versus the possibility for a lasting cure provided by a spinal operation. Finally, for patients who decide that nonsurgical care is best indicated for them, there are professionally applied modalities of treatment, as well as self-applied methods. Of course, self-managed practices are far less costly and might be the only option for patients who lack comprehensive health insurance coverage. We have always tended to advise patients to go with nonsurgical care whenever possible. For most diagnoses, this is certainly the safest and best guidance. However, for some diagnoses, like true facet joint syndrome conditions, surgery might actually be a great option for many patients. This is because it can address the structural problem with little collateral damage to the rest of the spine in most instances and can certainly cure pain when all goes well. What are the best drugs for facet syndrome? This question is one of the most common that we receive and we answer it with our usual honest and objective look at the risks and rewards of pharmacological therapy. How about the use of heat or ice for facet syndrome? Will these simple home remedies really do any good for providing pain relief? Facet joint injections come in several forms and are considered moderate treatment options. Injections might be ideal practices, depending on the cause of facet pain. 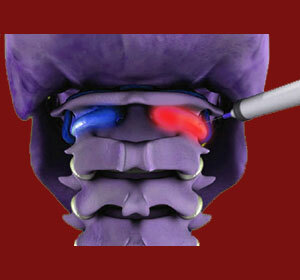 Facet joint nerve blocks can help to reduce or eliminate symptoms caused by any type of facet pathology. However, the therapy is extremely temporary and will not provide a good long-term solution for chronic pain. Prolotherapy is also a consideration for patients who prefer alternative and nonpharmaceutical injection treatment. Physical therapy for facet syndrome uses exercises and stretches to minimize pain and promote joint mobility, as well as improve overall physical functionality. Facet joint exercises can also be performed by the patient alone for more economical treatment of ongoing pain. Chiropractic for facet syndrome utilizes manual manipulation of the spine in an effort to minimize pain and increase joint range of motion. Facet joint chiropractic adjustments might be general or focused on specific joints in an effort to organically encourage healing and better mobility. Cox Technic for facet joint pain is a specialized form of manipulation that involves traction and may provide greater benefit for some facet joint diagnoses. Facet syndrome acupuncture might provide highly effective pain relief without the use of dangerous drug products. TENS for facet syndrome is another alternative to pharmaceutical treatment. TENS utilizes electrical impulses to disrupt nerve messages that signal pain. Spinal decompression for facet syndrome is more controversial than its application for intervertebral disc pathologies. Research is not as definitive as to the benefits of decompression treatment for arthritic issues in the zygapophyseal joints. Some of the most common nonsurgical decompression systems that can be used to treat facet joint pain include the DRX9000, AccuSpina, VAX-D and Antalgic Trak systems. Our proven pain relief program can provide effective prevention, management and cures for many types of chronic pain. The program is available anywhere in the world for immediate access 24 hours a day. Get help now! If you have decided that conservative treatment is your best bet, then be sure to read each of our essays on the various therapy options available to you. As you research, make mental notes of the rewards and limitations of each therapy. Additionally, be sure to account for the cost, as well as the availability of care in your local area. Most importantly, be absolutely certain that treatment is actually needed and will prove valuable to you before starting. This objective is best achieved by getting more than one opinion on your diagnosis and checking the facts of facet syndrome yourself to be sure that your condition has not been mistakenly identified as a joint pathology when the pain is actually a result of another structural or nonstructural mechanism. Noninvasive care is not always the best form of treatment for facet syndrome. In some cases, patients will benefit from surgical practices. Be sure to read our full coverage of facet joint surgery for the latest news, research and risks of the most popular forms of surgical care.